CarGurus has 612 nationwide CTS-V listings starting at $10,800. While the Cadillac CTS sedan gets a next-generation makeover for 2014, with a longer profile, a restyled exterior and an upgraded list of standard features, the performance-oriented CTS-V sedan retains the previous generation's design for another year. Cadillac offers four new exterior colors for the 2014 CTS-V, including Phantom Gray Metallic, Mocha Steel Metallic, Red Obsession Tintcoat and Majestic Plum Metallic, but other than that the sport sedan remains unchanged and will have to wait until 2015 or beyond for its new sheet metal and interior upgrades. That gives prospective buyers an opportunity to scour the lot at the local dealership and grab the current CTS-V at what could be bargain close-out pricing. What they'll get by buying now, instead of waiting for the new design next year, is a slightly dated but still trend-setting American sport sedan that competes well against its European and Asian counterparts, thanks to its supercharged 556-hp V8 and sport-tuned suspension with Magnetic Ride Control. They'll also get an attractive, comfortable everyday sedan with a sporty exterior design and an upscale, well-equipped interior. Base pricing for the redesigned CTS sedan jumps by about $7,000 for 2014, and buyers can expect the same increase, or more, when the new CTS-V arrives in another year or two, making the current version a compelling option for savvy buyers who like to get the most bang for their bucks. Competitors to the CTS-V in its top-of-the-line high-performance category include such sport sedans as the BMW M5, the Audi S6, the Jaguar XJ, the Lexus IS F and the Mercedes-Benz E63 AMG sedan. Like the CTS-V, all those vehicles feature some type of supercharged or twin-turbo V8 engine, and all post stellar 0-60 numbers. 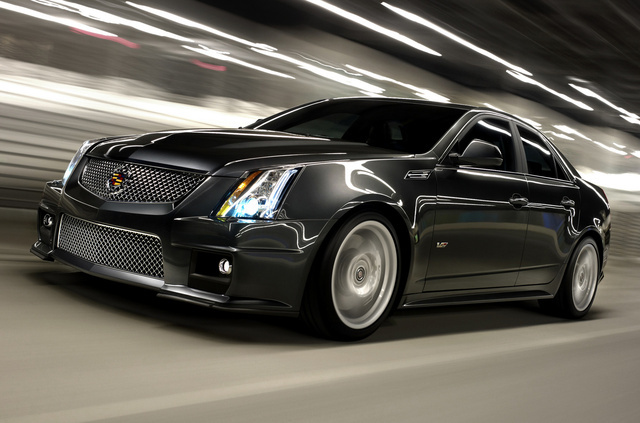 The CTS-V, for instance, makes the run to 60 mph in just 3.9 seconds. That puts it near the top of its class, since the Audi S6 makes the run to 60 mph in 4.5 seconds and the M5 does the same jaunt in 4.4 seconds, while the E63 AMG leaps out to 60 mph in just 3.6 seconds. Although the CTS-V doesn't quite dominate its high-performance class, it certainly makes a good showing, thanks to its big 6.2-liter supercharged V8 engine, which it shares in part with the Corvette ZR1. In the CTS-V, the V8 delivers 556 hp and 551 lb-ft of torque, making it the most powerful engine in Cadillac's history. The engine features an intercooled Eaton Twin Vortices Series supercharger with tweaked air inlet and outlet ports, which help to optimize airflow and provide smooth, efficient operation. Cadillac pairs the V8 with either a short-throw 6-speed Tremec manual transmission, which comes standard, or an available 6-speed Hydra-Matic automatic with a performance-oriented shift pattern and steering-wheel-mounted paddle shifters with tap up/down operation. Fuel economy numbers check in at 14 mpg city/19 highway with the manual shifter and 12/18 with the automatic. The engine requires premium fuel, and the gas-guzzler tax applies. The 2014 CTS-V continues to ride on a rear-wheel-drive platform with a sport-tuned suspension and a limited-slip rear differential, which channels the V8's powerful torque to the appropriate wheels. Cadillac also includes its Magnetic Ride Control suspension system with unique shocks, which use magneto-rheological technology to instantly adjust damping at all 4 wheels, as opposed to mechanical valves. The system monitors road conditions and makes adjustments instantly to control body motion and ensure an agile, highly competent ride both at high speeds and around town. ZF Servotronic speed-sensitive power-assisted rack-and-pinion steering with a variable ratio comes standard, along with high-performance Brembo brakes with available red or yellow calipers. The CTS-V receives 19-inch 10-spoke aluminum-alloy painted wheels with V-specific Michelin performance tires as standard equipment. Owners can add available 19-inch wheels with polished or satin graphite finishes. Outside, the CTS-V displays lines that now look outdated when compared to the redesigned CTS, especially with its stunning new front end. But the V's front end continues to serve as both form and function, since its large black chrome mesh grille and lower front scoop channel copious amounts of air to the engine compartment. The sculpted power-dome hood, HID headlights and rear spoiler with integrated brake light also set the CTS-V apart from its other CTS stablemates. Front foglights, Rainsense automatic windshield wipers, heated power-adjustable side mirrors, vertical LED taillights and center-mounted dual chrome-plated exhaust pipes are among the CTS-V's other exterior features. Inside, the CTS-V seats 5 passengers in its quiet cabin, which features an angular, contemporary design with high-quality materials, plenty of soft-touch surfaces and hand-crafted accents. Taller passengers might feel a little cramped in the backseat, and some reviewers say the front bucket seats emphasize sporty bolstering over long-distance comfort. The front seats feature 10-way power adjustment and power lumbar support for both the driver and passenger, and include sueded fabric inserts for a sporty appearance. Owners can add optional Recaro performance seats with 14-way power adjustment, leather trim, sueded fabric inserts and heating and cooling features. Like the standard bucket seats, the Recaro seats are firm and well-bolstered, but could become uncomfortable over long distances. A dual-cockpit design places controls within easy reach of the driver and front passenger, who are separated by a swooping center console with Obsidian Black accents. A thick leather-wrapped multifunction sport steering wheel comes standard, but owners can add an upgraded steering wheel with a sueded fabric rim, as well as a sueded fabric shift knob. The standard navigation system features a glide-up 10-inch LCD touchscreen, and includes an Ultrasonic rear park assist with a rear-view camera. The navigation system also includes a 40GB hard drive and integrates with a 10-speaker Bose Surround Sound audio system with Bluetooth, a USB port and a CD/DVD player. Keyless entry, keyless start, ambient LED lighting, automatic dual-zone climate control, an auto-dimming rear-view mirror and OnStar are among the other standard interior features, while other options include a power sunroof. Six airbags, including side-impact airbags, come standard in the CTS-V, along with GM's StabiliTrak electronic control system and traction control. The OnStar system includes the Directions & Connections plan with such safety services as automatic crash response, vehicle locater and remote door unlock. The system also includes a mobile app, allowing owners to control certain vehicle functions remotely. 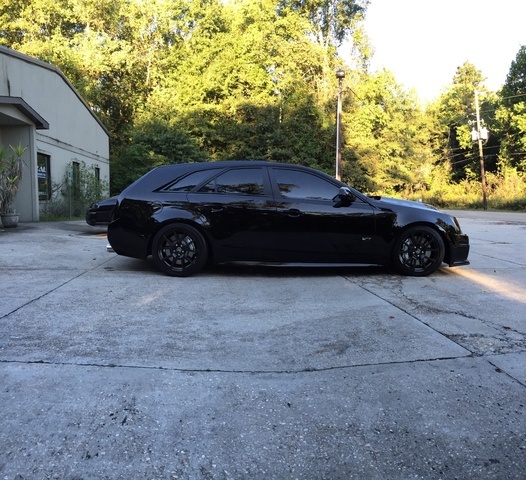 What's your take on the 2014 Cadillac CTS-V? TheHorror Hey, it's a V8 RWD wagon! Where were all you enthusiasts when it came time to prove you really want such cars? Users ranked 2014 Cadillac CTS-V against other cars which they drove/owned. Each ranking was based on 9 categories. Here is the summary of top rankings. Have you driven a 2014 Cadillac CTS-V?